Welcome dear runner to our special she believed she could so she did running category gifts page made just for you. We know you love it! Our:"She believed she could, so she did." running quote became very quickly one of our most acclaimed designs within our running community. We decided to make it easier for you to find all our products baring our unique and most in fashion design. Our products include a she believed she could so she did poster, tees, tank tops, arm warmers, bags, virtual races, car stickers and medal hangers. Of course we also offer some she believed she could so she did jewelry like bracelets and shoe tags. Find the perfect gift for your women runner. You deserve it. Join our running community of women who truly rock their way towards their running goals and their healthy life challenges. None of us would ever do it if we didn't believe we could! 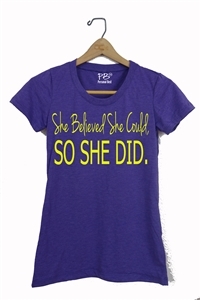 You know the motto...She believed she could ... Shop now at Running On The Wall, we offer fast shipping and quality guaranty!